Captain Cleve Connell has already made a name for himself among pilots when he arrives in Korea during the war there to fly the newly operational F-86 fighters against the Soviet MIGs. His goal, like that of every fighter pilot, is to chalk up enough kills to become an ace. But things do not turn out as expected. Mission after mission proves fruitless, and Connell finds his ability and his stomach for combat questioned by his fellow airmen: the brash wing commander, Imil; Captain Robey, an ace whose record is suspect; and finally, Lieutenant Pell, a cocky young pilot with an uncanny amount of skill and luck. Disappointment and fear gradually erode Connell's faith in himself, and his dream of making ace seems to slip out of reach. Then suddenly, one dramatic mission above the Yalu River reveals the depth of his courage and honor. 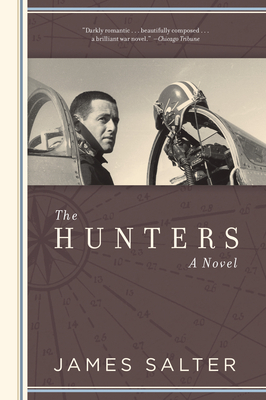 Originally published in 1956, The Hunters was James Salter's first novel. Based on his own experiences as a fighter pilot in the Korean War, it is a classic of wartime fiction. Now revised by the author and back in print on the sixty-fifth anniversary of the Air Force, the story of Cleve Connell's war flies straight into the heart of men's rivalries and fears.